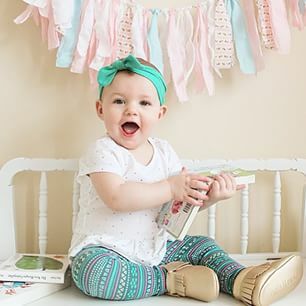 Our Moccasins have an elastic opening which allows the shoes to stay comfortably on your child’s foot. Each shoe is lined with cotton to keep the foot dry & warm. They also have flexible soft sole inserts which make these both great crib shoes as well as walking shoes for any age. Moccasin sizes are different than traditional shoe sizes. Below are the average ages that fit each size. It is always best to measure your child’s foot using our MOCCASIN SIZING CHART prior to ordering. Moccasin sizes are different than traditional shoe sizes. Below are the average ages that fit each size. It is always best to measure your child’s foot using our sizing prior to ordering.